WASHINGTON -- The U.S. ambassador to the United Nations says there's no question Russia was involved in the U.S. presidential election and that the actions of the Kremlin will be addressed after the investigations are completed. "We don't want any country involved in our elections, ever," Nikki Haley said in an interview aired Sunday on ABC's "This Week." Russian President Vladimir Putin has denied his country meddled in the contest between Republican Donald Trump and Democrat Hillary Clinton. While the Trump White House rejects any suggestion that Trump or his staff had connections to Russia, Trump himself has said he believes Russian operatives hacked Democratic Party emails but that any Russian involvement in the election didn't affect the outcome. U.S. intelligence agencies report that Russia tried to help Trump's campaign effort. The FBI as well as congressional committees are investigating whether the Russian government coordinated with Trump associates during the campaign. 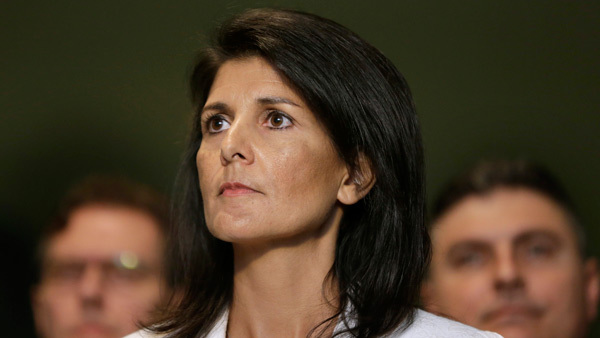 Trump as president persuaded Haley to leave the governorship of South Carolina to represent the U.S. at the United Nations. In the interview with ABC, she said Trump hasn't told her not to criticize Russia and that she was "beating up on Russia" over issues such as its actions in Crimea and its dispute with Ukraine. "There's no love or anything going on with Russia right now," she said. "They get that we're getting our strength back, that we're getting our voice back and that we're starting to lead again, and, honestly, at the United Nations, that's the No. 1 comment I get is that they're just so happy to see the United States lead again." Haley said the U.S. is also pressuring China to take a firmer stand regarding North Korea's nuclear program. China provides diplomatic and economic support to its neighbor but claims that its influence over Kim Jong Un's government is limited. U.N. resolutions have failed so far to deter North Korea from conducting nuclear and missile tests. Last year the North conducted two nuclear tests and two dozen tests of ballistic missiles. The U.S. would "no longer take the excuses from China that they're concerned, too," Haley said. "They need to show us how concerned they are. They need to put pressure on North Korea. The only country that can stop North Korea is China, and they know that." Asked what the U.S. would do if China doesn't cooperate, Haley said: "China has to cooperate. This is now down to, do we want to continue to see these ballistic missile attacks from North Korea or does China want to do something about it?" She added: "At some point, we need to see definitive actions by China condemning North Korea and not just calling them out for it."